Chu-kù: "Together we aspire, Together we achieve"
Kok-koa: "Forged from the Love of Liberty"
Trinidad kap Tobago ê só͘-chāi. Trinidad kap Tobago Kiōng-hô-kok sī tiàm-tī Carib-hái tang-lâm-pêng ê hái-tó kok-ka. Chit-ê kok-ka chú-iàu sī Trinidad-tó kap Tobago-tó nn̄g-ê tó cho͘-ha̍p khí--lâi, só·-í kok-miâ hō-chò Trinidad kap Tobago. Trinidad kap Tobago tī 1962 nî tùi Liân-ha̍p Ông-kok to̍k-li̍p chhut--lâi, hiān-chú-sī ia̍h-sī Commonwealth of Nations ê hōe-gôan-kok. ↑ "2011 Population and Housing Census - Preliminary Count, page 4" (PDF). Central Statistical Office (CSOTT). 2016-12-31 khòaⁿ--ê. ↑ "Population Mid Year Estimates". Trinidad and Tobago Central Statistical Office. 27 May 2016 khòaⁿ--ê. ↑ Trinidad and Tobago 2011 Population and Housing Census Demographic Report (PDF) (Report). Trinidad and Tobago Central Statistical Office. p. 2. 27 May 2016 khòaⁿ--ê. 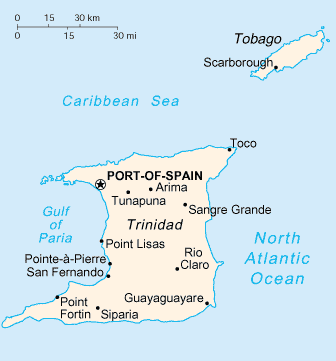 ↑ 4.0 4.1 4.2 4.3 "Trinidad and Tobago". IMF. Chit ia̍h siāng bóe tī 2018-nî 7-goe̍h 27-ji̍t (Pài-gō͘), 16:25 ū pian-chi̍p--koè.